A gang of ne'er-do-wells in California after the Great War hang out in the house of their friend avoiding work and the law. Danny inherited two houses from his grandfather. One of those houses is burned down by his friends so they all pile into the remaining house. The guys have various adventures, drink a lot of wine and seduce any woman who will have them. Rinse and repeat. That's pretty much how the plot rolls in John Steinbeck's Tortilla Flat. The paisanos in Tortilla Flat fit well in the popular Guys Just Want to Have Fun canon, including The Three Musketeers, The Three Stooges, The Dukes of Hazzard, Harold and Kumar, and The Trailer Park Boys. Steinbeck relied on the King Arthur and Knights of the Round Table legend, arguably the genesis of that canon. Although the guys have many great adventures, they spend part of the time discussing their own brand of morality and deciding upon acts of chivalry. How these acts are accomplished is what gets them in trouble but at least their hearts are in the right place. I grew to love these guys, which is weird since I couldn't stand The Three Musketeers. Danny opens his home to anyone who needs a place to stay. Pilon is the philosopher of the gang, often rationalizing his actions in the name of the greater good. As the story progresses, the group grows larger, but the men see each other as great friends. They're always there for one another in their own peculiar ways. They may be poor but they are rich in friendship. Their antics are silly and entertaining. Unexplainable, mystical occurrences happen to them from time to time giving the story that mythic quality. I could tell that Steinbeck had great affection for his characters. In the end, I was glad to have read Tortilla Flat, even though I had my doubts at the beginning. The reader can take it at face value as a comical story or one with a deeper meaning of friendship while struggling with poverty and hardship. It's no East of Eden but it is entertaining. This will probably not be my next Steinbeck but it does sound fun. And very unlike most of his books! I have always enjoyed the Steinbeck books I have read, so I should give this one a shot! This is on my readathon stack- I'll go for light comedy reading for $500, Alex. Hm, it doesn't sound like there's a lot of plot. Not sure it's for me. I read this a long, long time ago. Maybe in high school or college. I live a few hours from Steinbeck land, so he was a popular author to assign. I don't remember much about this book, other than wondering what the point was. I like to read about guys having fun. I think I might need to put this on my list. Nymeth- Yes, it is extremely different. Amanda- Hope it keeps you awake during the readathon. Jill- I'm not sure there is one. Silsbee- Good luck, I hope you like it. I know most of the group didn't care for this book, but I enjoyed it. It's not one I would have picked out to read on my own, but I thought it was amusing. I think I've known people growing up that were similar, but not nearly as bad (I hope;-). 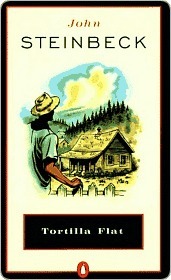 Ah, I really like Steinbeck and so will probably get to read this some day. But it does not sound like my cup of tea at all. I'm with you on Three Musketeers. But if you liked it regardless, there is at least a little hope!